Swiss voters want to keep the country's compulsory military service, exit polls from the latest national referendum on the topic have suggested. Voting trends indicated a large majority of Swiss rejected plans to abolish conscription. Correspondents say the Swiss Army is regarded as costly and many young men complain that their time is wasted. But older voters say obligatory duty in the armed forces remains the best way to defend the neutral country. In the canton of Ticino, voters were being asked whether full face coverings like niqabs should be banned in public places. There were also votes on mandatory vaccinations and longer shopping hours at night. The vote on conscription was the third in Switzerland on the matter in almost quarter of a century. Pacifists and left-wing parties campaigned for abolition. They did not expect to win, but rather muster more than a 30% share of the vote. 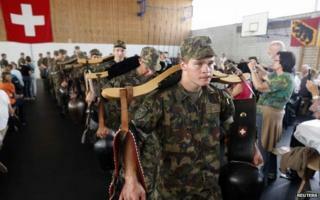 Male Swiss citizens aged between 18 and 34 begin service with weeks of basic training. They then keep their uniforms and weapons at home to be ready for tours of duty. Women can serve voluntarily. Conscientious objectors have the option of undertaking non-military service, for example in environmental projects. Men who do not serve pay a special tax of 4% of their salary. Centre and right-wing parties argue the measures are needed to maintain Switzerland's army in a time of security challenges. They argue it helps to bring together a country with three main language groups: German, French and Italian. "Abolishing military service would break the genuine link uniting the people and the army," Defence Minister Ueli Maurer said. Critics say the end of the Cold War removed the need for large-scale forces with fighter planes, tanks and artillery. Switzerland has not been invaded since the Napoleonic Wars of the early 19th century. "Compulsory military service is a tool created for wars of the past," said Tobias Schnebli of the anti-military group, Group for a Switzerland Without an Army, told the news agency, AFP. Recent scholars have questioned the belief that the Swiss military's complex of underground bunkers deterred an invasion by the Nazis during the Second World War, AP reported. Some historians argued that Adolf Hitler left the Swiss alone because he wanted to use their banks.